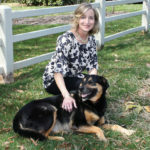 Today I’m joining forces with a group of bloggers to raise awareness of animal rescue. 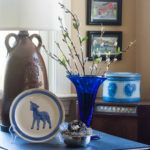 Animal rescue is near and dear to my heart since our dog Sherman was adopted through the Campbell County Humane Society. One way that you can support your local animal shelter is to not only donate money, food, or supplies to the animals but also to shop. Shop? Yes, shop! Quite a few animal shelters run thrift stores to raise money for the shelter. 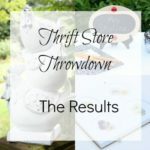 Our blogging group challenged each other to shop at a local thrift store that benefits animals, make over an items purchased, and share it today. 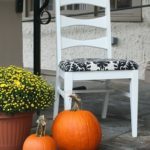 Last year I participated in this same challenge and made over a chair. 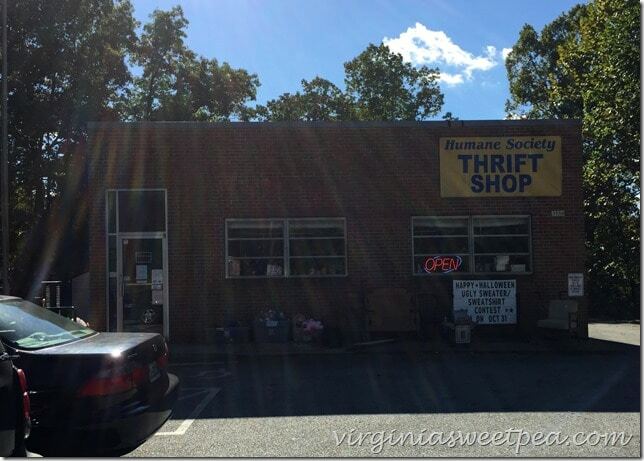 Just down the road from my school is the Humane Society Thrift Shop that benefits the Amherst County Humane Society. It’s in the old Monroe Post Office and I love to pop in from time to time to see what treasures I can find. If you like cats, this is a fun place to shop because a few cats live in the store. 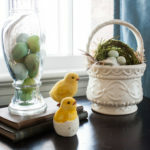 I found this milk glass lamp for just $3. You can tell that this is not the original lamp; someone jerry-rigged it with wooden pieces and a wooden base. 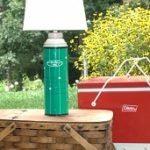 After leaving the thrift shop, I headed to Lowe’s for a new cord, shade, and spray paint. While waiting in line to pay for my items, a young man behind me in line asked me if I was just at the thrift shop. I told him that I was and he said, “I thought so, I saw you taking a picture of that lamp.” I explained to him what I was doing and both he and the Lowe’s cashier were very interested in my project. After I got home with the lamp, I took another “before” shot to better show the lamp’s details. I then took the lamp apart, sanded the base, and cleaned the white milk glass pieces. 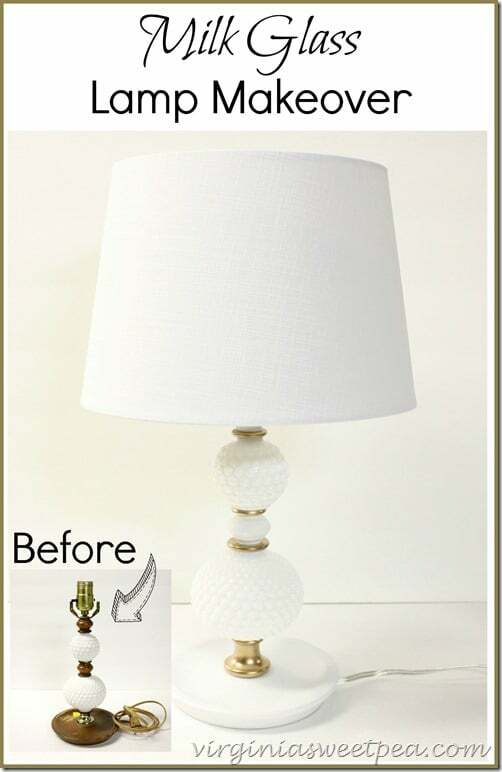 I used gold paint leftover from this lamp makeover and flat white spray paint purchased at Lowe’s to refresh the lamp’s small pieces. I then put the lamp back together, rewired it, and added a new shade. Doesn’t my lamp look great now? 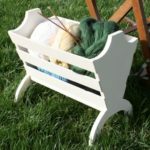 This will be my mom’s future beside table lamp in her bedroom at the lake. Our house is getting so close to completion! I love the white and gold combination. I can’t wait for my mom to see her new lamp and really can’t wait until she can enjoy it in her bedroom at the lake. This makeover cost a total of $33, most of which was the cost of the shade and new cord. I’m so glad that I could give this old beauty a makeover and I’m glad that she will be used for many years to come. 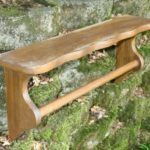 If you like this project, I’d love for you to pin it! Wow, what a difference Paula! It’s so soft and feminine now. 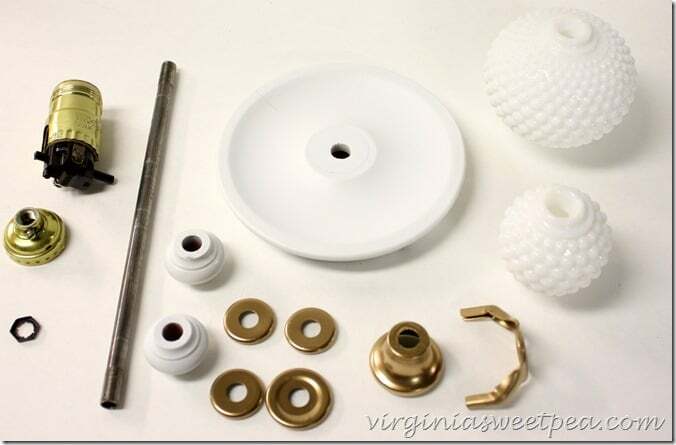 Love the hits of gold with the white milk glass. 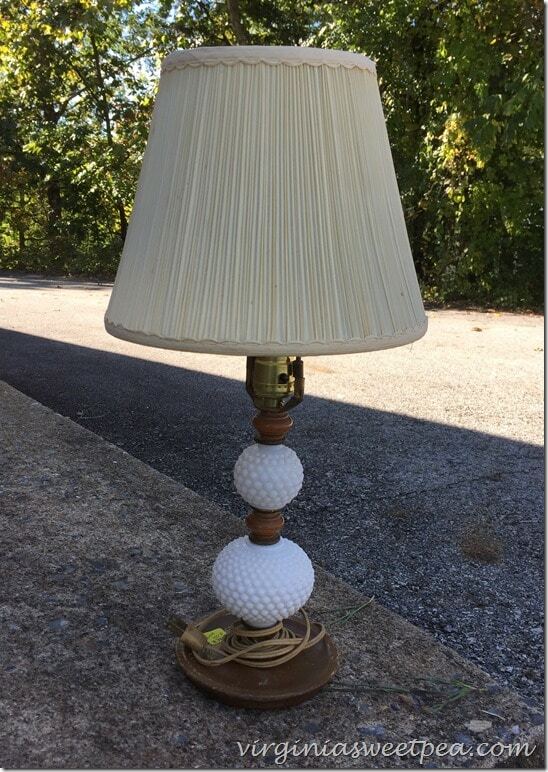 I bet your Mom was thrilled with her new lamp! Wow! 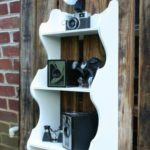 I LOVE this makeover and what a great find at the thrift store! Your little lamp reminds me of a milk glass lamp that was in the room where I usually stayed at my grandma’s house. I often wish I had that little lamp! 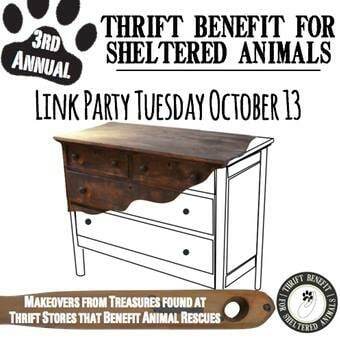 I’m keeping my eyes open for one next time I go thrift shopping! What a great memory, Julie! I hope you find a lamp on one of your thrifting adventures. This is beautiful!! I love that you made it all white and gold. It is the perfect combination of classic and modern! Thank you, Megan! I also thought that the white and gold made it look more modern. 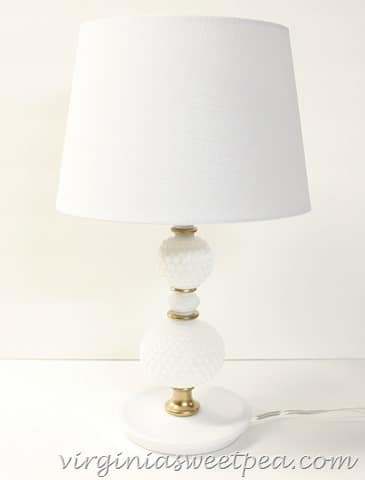 Paula, I love the crisp look and style of the lamp. 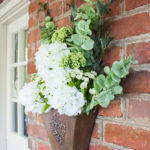 What a great makeover and easy tutorials. 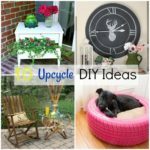 Whit you’re tutorials anyone can makeover a thrift store lamp and help the animals too! Thank you so very much for joining again this year. I love helping the animals, Jeanette! Thanks for inviting me to participate. What a coinkydink! 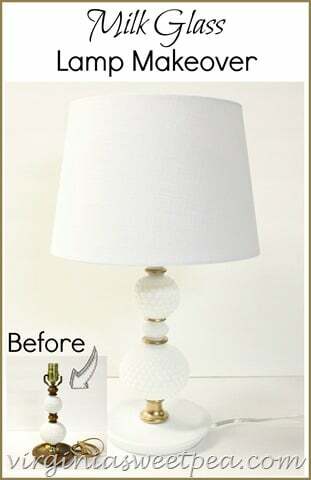 I bought a lamp very much like that at a thrift shop, intending to redo it. It’s sitting at my barn/crafts shop waiting for a lazy bum to fix it up. Lazy bum being me….who is inspired by you to actually do it! Excellent job you did there, I must say! Good luck with your makeover, Denise. I did the painting and cleaning one night after work and then put it together the next night. It won’t take you long at all to do your project. Please send a picture of yours to me when you finish it. I would love to see it. 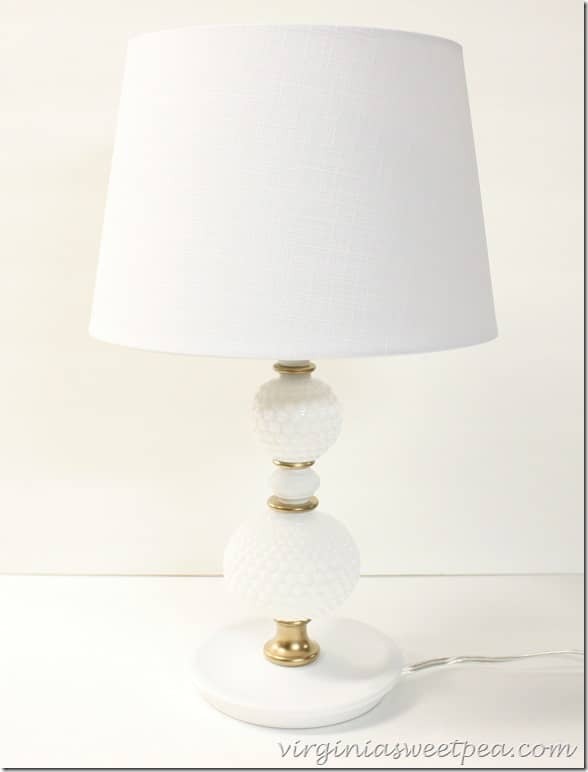 The Lamp turned out just beautiful loving the hints of gold perfect touch to the all white….sooo pretty! Thank you, Tammy! I’m so pleased with how this turned out and know that my mom will love it in her bedroom. Love it!! I especially how you were so attentive to the pretty details of the lamp. The fresh paint and good cleaning really bring those out. Awesome! Thank you, Karen! I’m so happy with this lamp. Wow! What a difference. The paint and the new shade look fabulous! Thanks for inspiring me (once again). Thank you, Meegan! I think I squealed with pleasure when I put the shade on the lamp. I’m so happy with it. This is lovely! What a different changing the details to white and gold made – wow! Thank you, Christina! I’m so pleased with it. Absolutely gorgeous! And what a find at the thrift shop! Thank you, Meagan! I liked the $3 price tag. 🙂 Lamps are almost always one of the first things that I investigate when thrifting. Incredible what a little bit of paint will do to make outdated turn to elegant and chic. It looks so much better now. Great job! Thank you, Lucy! 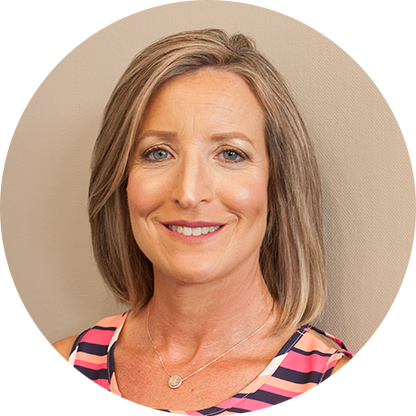 I’m thrilled with the end result of this makeover. 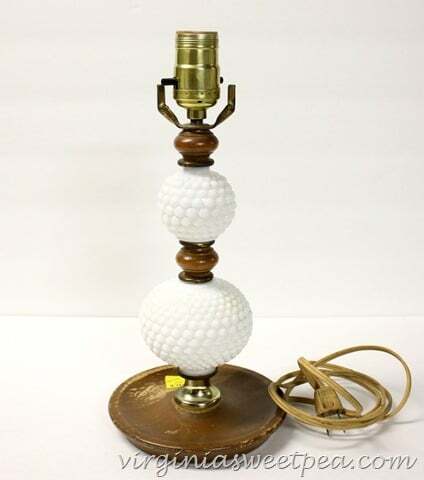 I have a very similar lamp, with the wood mixed with milk glass (also looks jerry rigged as the wood is in different tones!). I wasn’t sure what to do with it, but now I do! This looks so pretty and fresh! Wow! 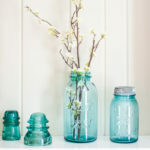 Lovely transformation…love milk glass! I generally like wood trim, but the gold/white combo looks so new and fresh. 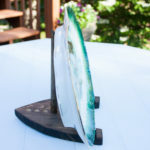 I also love lamps with that kind of base; perfect for the day’s earrings, reading glasses or lip balm! Your Mom will love it! Thank you! The base is perfect for small things. I really hadn’t thought about that! What a beautiful transformation Paula. It’s like night and day. 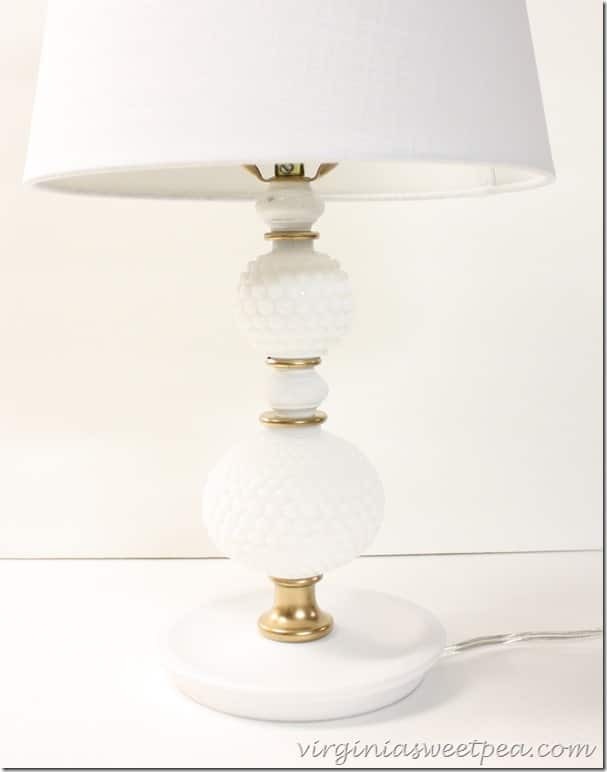 The refreshed lamp will be perfect for your mother’s bedroom at the lake house! Thank you so much! 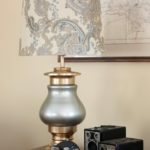 Mama loves the lamp in her bedroom at the lake that’s filled with vintage goodies. 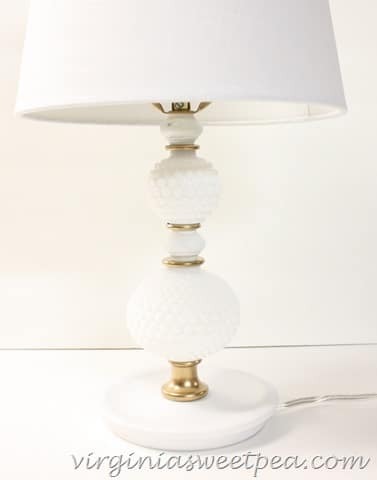 Gorgeous; I’m a huge fan of milk glass and you really did this lamp justice! Thank you! I’m so glad that I rescued it and gave it a new life.